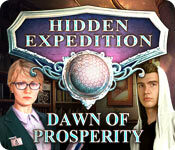 Hidden Expedition: Dawn of Prosperity is rated 3.7 out of 5 by 20. Rated 5 out of 5 by CourageAngel from Optimus, Genius Teens, and a Viral Threat? We enter into this game with a scene where a man is narrating. He even included a line about "the bitterness of a rejected child." Foreshadowing? Possibly. From there, we, at H.E.L.P. receive a coded message and are sent to investigate. We arrive and notice the unusual tremors. Sam, who I was happy to see in this game, is soon neutralized for the rest of the game, sans the ending scene before the credits. We soon are sent to investigate about a girl who runs away/goes missing and it leads into a whole other mystery. For a Hidden Expedition game, I did enjoy it. I mean, I was a little sad at the lack of Sam in the game, as I find him an enjoyable addition. It seemed like we just started and then we were on our own for the mission. I will say that it didn't take away anything from the game, especially when you're sneaking around a high security area. The visuals and sound are, as always, amazing. The story was interesting, and there was a twist I didn't expect. I think that the SE wrapped up the story nicely. It does make me wonder about the bonus chapter in the CE, but I don't think it would add or subtract anything from the story or the fun I had playing it. The puzzles weren't too difficult, and there were some that I really enjoyed. The demo is there to give you an idea on whether you would like to play the game, but it won't give away everything. That would spoil the rest of the game. If you're interested in this game, I recommend trying the demo. For an addition to the Hidden Expedition series, this game didn't disappoint. Rated 5 out of 5 by SparkleGlow100 from A BREATH OF FRESH AIR I thoroughly enjoyed this game from start to finish. The game starts with bizarre earth tremors and a missing lady who is in her early 20’s. A compelling story that keeps giving you new info all the way to the end, so the story stays fresh. You are on a mountain, covered in a forest. This game has a lovely mix of different scenes: science labs, trees, caves, lakes and water, computers, gadgetry and robots, living quarters of various types, and official buildings set in a spacious paved area. LOTS of tech and LOTS of nature too! You are indoors then outdoors and so on. The characters are very well done and have personality. The graphics are natural looking which I liked; no exaggerated colors or color schemes. There are plenty of PUZZLES of varying difficulty. A few of them are very difficult. The HOPS are enjoyable, nice to look at, and are a mix, requiring different types of interaction. The subject items in the HOPS are also a good mix of different topics. FACT cards to collect. The jump MAP shows you current location and all the places where something needs to be done, either now, or once you have acquired something. A good break from games that are spooky, fantasy, or who-dunnit. Not a single rune-stone, tarot card, candle, or beasty appear! Rated 5 out of 5 by sfr8rfan from Morning Has Broken... I gave Dawn of Prosperity CE 4 stars(4.75 if partial stars were available). I’m awarding 5 for the SE. There is one simple reason: I don’t think the extras of the CE, most importantly the bonus chapter, are worth the extra money. Consequently, the SE, especially at a discounted price, or for the use of a coupon and, therefore, free…is a KILLER DEAL. How fun is this game? If there were more Fun Factor stars available, Dawn would be even more highly rated. I'd give it 20 out of 20. If you’ve read my reviews, you know that I am not one to give out 5 stars easily but Dawn of Prosperity SE deserves every star it gets. Others have already told you what to expect around every corner. What I'm telling you is that this game is fun. Typically, I will test a game using the free hour and then, in a day or three, make a purchase if the hour went well. I didn't want to wait this time. I COULDN'T wait. A the saying goes, I may not be able to define "fun," but I know it when I'm having it. I had tons of fun playing this game. I'm a slow-poke of a player. This is a game where that's a value. I enjoyed it so much I didn’t want to finish it quickly. The protagonist is a female detective from some agency of "the Law" in Montana. This isn't a murder mystery. There is a mysterious rise in seismic activity. The idea is that something sinister is the cause. Our purpose: find it. I will make my one and only plea for a corrective to this and most other game: give the game-player a choice of male of female for voice. A story can be written ambiguously thus allowing for either and this story would be well-served to employ that technique. WHAT YOU’LL SEE AND HEAR: The game looks good (and bright). Colors, summer colors, are bursting on your monitor and it's a joy to behold. The animation is good. The characters are well drawn. There is an effort at lip-synching. While not the best (on its own merits) it's far better than what we usually see, always causing me to wince. I can't tell you right now which game is better with lip synching. The lips start moving at the same time the voice actors start talking. They don’t stop moving until the actors stop talking. Most importantly, they also don't stop a second or two after the actors have stopped. In other words, the lip synching is...synchronized! HOW YOU’LL BE CHALLENGED: While the puzzles are plentiful, they are not difficult. There’s nothing "new" but there are some FUN twists given to familiar games. Aside from the "official" mini-games there are other "mini" mini-games as dawn is prospering all around us. Although they are easy, the mini-games add some challenge to the game. And they are all FUN. Identifying my favorite doesn't matter. You'll have your own. Anyway, this review is for your benefit, not to compete for Top Reviewer status. There are fewer HOGs than mini-games. I think the HO scenes are very well done. They are Part puzzle/part HOG. 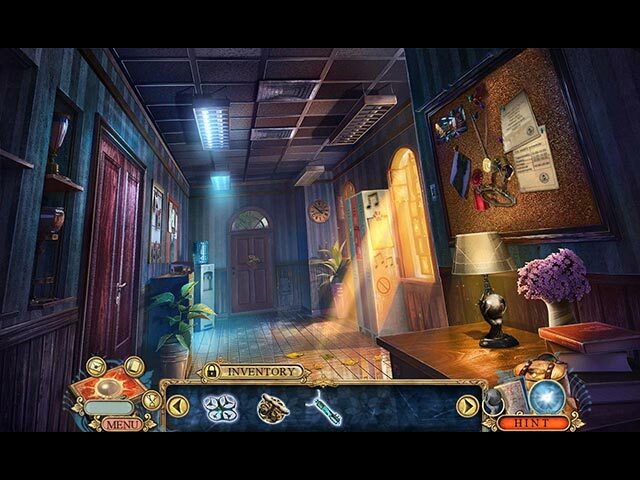 One object is used to advance and uncover other hidden objects. This multilayered HOG format is far more interesting than a simple list find. Another HOG format in Dawn is finding multiples of an object or similar objects. No matter the format, the HOGs are all FUN. WHAT’S THE GAME ABOUT? : The story line is straightforward, though improbable. The first cause...a lot of substantial earthquakes in Montana...is not outside the realm of possibility and so this game is closer to "real life" than SO MANY games in the recent past. It is a welcome change. All of the elements of the game, the HOGs and mini-puzzles, are clearly supporting the story line. This is not a Hidden Object scene or a puzzle in search of a story. WHAT YOU’LL MISS IF YOU DON’T GET THE COLLECTOR’S EDITION: A. All the typical CE Bling (i.e., the "who cares?" stuff). B. Collectibles in each scene. C. “Fact cards" which will explain a number of scientific theories and seismic insights. D. Morphing items. E. Achievements. F. A strategy guide. G. A bonus chapter. CE OR SE? : I've played the bonus chapter. My suggestion is that the SE is a greater value for the price and that's why it earns 5 out of 5 stars, versus the CE is which is not as great a value. Don't misunderstand me, please: The CE is exceptional. When it was all that was available, I recommended buying it. Now you have a choice. In fact, if collectibles, achievements and morphing items are why you get CEs, you should buy the CE. Make your choice for CE or SE based on those extras, not on the additional chapter. The bonus chapter heads off in a different direction that doesn’t flow from the main story and is not worth the extra money or the use of two game credits in my opinion. No matter what you decide to purchase, I'll be surprised if you're not quite fond of your choice. I got the CE and don't regret it for a moment. As always, I suggest taking advantage of the free time given by BFG. First use the free hour from the CE, then shift to the SE. You'll be able to move quickly through the SE demo because you've already played most of it in the CE. You'll then see what you're missing and that will make your decision for you. In the midst of a deluge of princess-themed, fantasy-driven games, (of which, frankly, I'm very tired) Dawn of Prosperity is a very welcome change. You will truly enjoy this. I strongly recommend this game! Rated 5 out of 5 by pennmom36 from Welcome To Optimus The City Of The Mind Get ready for another action packed Hidden Expedition adventure agent. Pinpointing the source of man-made earthquakes will be the easy part, finding a way to penetrate the dome of the old Observatory is a whole different ballgame. Separating reality from fiction could prove impossible in the city of the mind, a matrix world inspired by one man with a vision to create another world filled with lies and deceit! It just takes a little skill, some motivation, and a bitterness that lies deep within the pit of a rejected child's stomach. I recently researched some fun facts about the Hidden Expedition series recently, because I wanted to find out what H.E.L.P stood for, the P was stumping me. Turns out that this league has had a few name changes over the years. In Hidden Expedition: Titanic, the league went by the name of H.E.A.L, which was the Hidden Expedition Adventure League. In Hidden Expedition: Everest, the league was simply the Hidden Expedition Club, and Hidden Expedition: Devil's Triangle was H.E.A.T which stood for Hidden Expedition Adventure Team. The newer games feature the name H.E.L.P which stands for Hidden Expedition League of Preservation (my guess originally was protection) I guess this is a lot of useless information, but now you know! In true HE fashion, there are 20 Fact Cards to collect with information on such topics as average precipitation, radio telescopes, magnetic tape, and even the meaning of sound waves. Many of the inventory items have Plus Signs which indicate some type of interaction needs to take place before the item can be used. The Collector's Edition has the addition of Collectible hidden Globes, Achievements to earn and Morphing Objects within the HOP's. 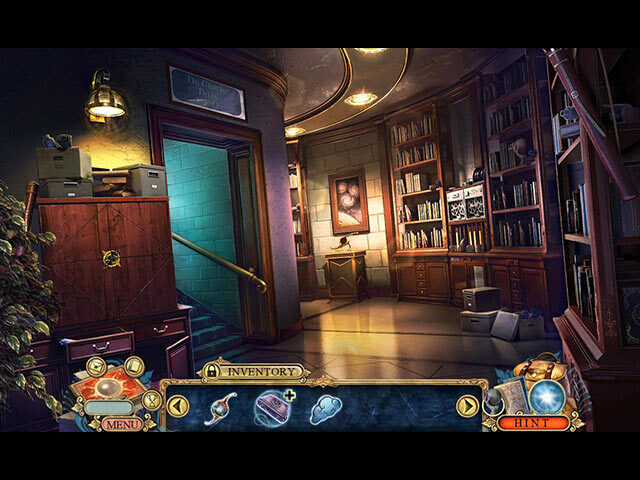 The Hidden Object Scenes are over the top as expected in this series, progressive, interactive silhouetted shape finds where you must find items and use those items within the scene to expose other items. HOP's where you find 5 ink pens and 5 staplers to use on an ink pot and papers which opens up an interactive list search, and there is even a Hidden Object Scene where you must use binoculars to find items related to the clues shown in a paragraph at a time. There are also a few smaller HOP's within zoom zones where you just have to find a handful of useful items. The Mini Games are really fun and all seem to be related to the subject at hand, decoding the signal by moving soundwave segments to their correct positions using sliders and arrows. Arranging tokens using empty slots so that the lowest values are on the left and the higher values are on the right. There are even small games where you are tasked with stopping the target in the correct safe zone or aligning targets to pinpoint the correct areas. The Collector's Edition has 13 Achievements, 10 Morphing Objects, 28 replayable Puzzles, 12 replayable HOP's, 6 Videos, 44 Collectible Globes, 12 Concept Art pictures, 8 Wallpapers, 9 Soundtracks, the Making of, a Souvenir Room, a built in Strategy Guide and a Bonus Chapter, enjoy! Rated 5 out of 5 by biscuitsmama from THE BEST HIDDEN EXPEDITION. A WONDERFUL GAME You and your old sidekick Sam are off again to solve another case for H.E.LP. A mysterious signal has been noted in an area in Montana where a recent swarm of earthquakes has occurred and some higher power has requested the aid of H.E.L.P. agents. Of course, you have hardly arrived on scene when Sam is disabled so it looks like you are on your own. As you begin to investigate you find that there are some very strange events occurring at a nearby abandoned observatory that is now some sort of secret facility. When you finally jump through enough hoops and make contact with H.E.L.P headquarters you find out your mission is to rescue someone who is being held captive in the observatory and once you finally gain access your adventure truly begins. What is really going on at the observatory and how can you rescue someone who doesn’t seem to want your help? With this being a game from one of the top developers, we already know the graphics will be exceptional and of course so is the sound package with the voiceovers being excellent. Technical Aspects of the game include four modes of gameplay: Easy, Medium, Hard, and the Custom option where you can set up the game for the way you want to play. Your tools include the ever-present H.E.L.P. box that contains your video messages, fact cards, and a section that shows your achievements. You also have an interactive, transporter type map that is found early in the game. The thing that I dislike about the recent Hidden Expedition games is that with the H.E.L.P. box we no longer have a journal. It would be very helpful if the developer would add a section for notes that we could review when needed. I don’t want to replay the emails or videos when I need to check back on some information in the diary. The HOPS are interactive and some are multi-tiered but most seem to be the list type that I enjoy. The mini-games seemed quite good and different than those we normally find, and early in the game they include a lock-pick puzzle, another where we arrange tokens in ascending order, and one where we swap and rotate disks to create a pattern. The puzzle that gave me the most trouble was one where we had to align patterns on an oscilloscope. Maybe I didn’t understand the mechanics but I finally skipped that one. Overall the puzzles seemed fairly easy as is the norm in recent years but I keep holding out hope that the puzzles will become a bit more difficult as the game progresses. I LOVED this game and purchased the CE. After playing it I think it was one of the best HE games in the series. It was one of those games that captured my attention and held it throughout the game. Everything about it was excellent from the HOPs to the puzzles to the storyline. Even though I loved the game, as always, I recommend that you try the demo for yourself to see if this is a game you will enjoy. Rated 5 out of 5 by skullfun from This is my Favorite of all the Hidden Expedition Series!!! I completed this outstanding adventure and I am proud to be a recruit of Hidden Expedition League of Preservation (H.E.L.P) This is a gorgeous and thrilling HOPA which you absolutely must experience. Outstanding Puzzles and HO's which are new to this genre. The bonus play is exciting and challenging as well. Which is why I chose the CE over the SE version. The graphics are stunning and the v/o acting was great. BRAVO!!!! Rated 4 out of 5 by mharrsch from Clear graphics, Excellent minipuzzles and good story This Hidden Expedition includes an adventure in a secret lab with a gifted genius gone mad. The graphics were clear, voiceovers believable, and minipuzzles particularly interesting. One of the more challenging puzzles was a grid of tiles with a strip in the middle with symbols on it. The goal was to move tiles with symbols on them placed randomly around the grid to the matching tile with symbol on the center strip. However, some tiles you encounter will rotate the symbol on the tile you are working with by 90 degrees and others will change its background color. There are also some stationary obstacles to contend with as well. To make matters even more complex, some of the columns of the grid have both up and down arrows to use to move the tiles while others may have only a down arrow or an up arrow. The rows of the grid are likewise with some having both a left and right arrow while others have only a left arrow or right arrow. Some rows and/or columns have no arrows at all so you must plan your tile movements accordingly. The exercise is not complete until all tiles with the appropriate blue background color and in the proper orientation are sitting atop their matching counterpart on the center strip. Another puzzle I enjoyed was a mechanical system where you are given a collection of different lengths of augers and toothed-gears and must assemble them to transfer movement from a gear rotating an auger down in the lower right-hand corner to a motionless gear in the upper left-hand corner. It was quite gratifying to get each successive piece of auger rotating! There was also a fun little activity where you compared forged signatures with an original signature and had to point out the differences on the forgeries. Since I studied forensics I enjoyed that, too. Overall, a well thought out game! Rated 4 out of 5 by ninja226 from Subvert mad genius plan to bring humankind back to Stone Age Graphics--outstanding. Clear, bright, crisp. Characters are life-like. Everything is well done. Wish all HOGs had this level of quality. Contemporary settings. Storyline--plausible, engaging, mystery Mini games--good HOS--good, more selective than most games, with an emphasis on findings items instrumental to advancing the plot. The only shortcoming of the game that prevents me from giving it 5 stars is it's on the short side of gameplay. I would have liked the game to go on longer since all the elements were executed so well. Rated 4 out of 5 by Yurnmesis from Good Storyline. Science Related. Interesting Concept. Overall: Very long game, lots of technical and computer equipment, interesting and informative journal. Never quite sure where I needed to go, but with good hints and transport to next task, I just enjoyed the journey. Great character development and logical forward movement with interesting storyline. Fact cards are helpful, informative and educational. Graphics: Excellent Sound: Good Music: Didn’t have to turn down. Hints: Responded very quickly which I enjoy. 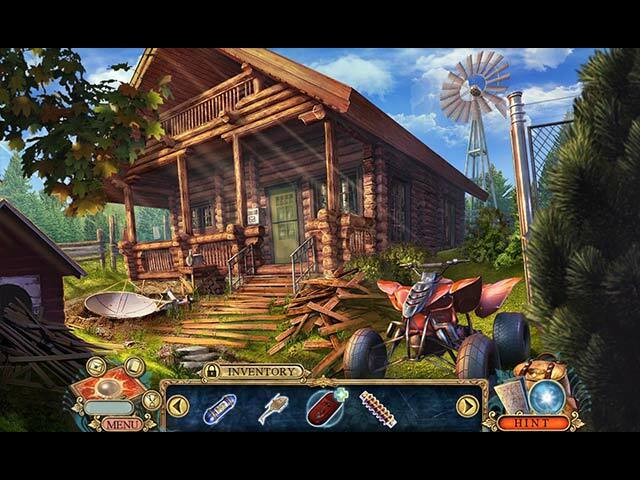 Hidden Object Games: Varied and well done with only a few dark corners. Objects are clear and interesting. Many are match objects to scene vs. words. Mini Games: Lots of science related. Easy to very complicated or very long process to complete. Storyline: If you like science, you’ll enjoy this game. It is different and unusual and a nice change from the dark and macabre. You explore a number of interesting scenes and the people are well developed as well. Plot twist and turn and of course you get to save everyone and the world.